I was idly internet surfing one day (okay, I admit it, every day), but this particular day in early January I noticed a 'Creative Courage' course promoted. It featured interviews with creative women (and I'm a sucker for interviews). Amy Ng of Pikaland fame was one of them and when I saw Belinda Kemp (Gretchenmist) was another, I found myself clicking on all the necessary buttons to buy my place. The 7-week course started on a Monday. I had signed up on the Sunday. So there was no forethought, no research, no investigation into whether it would be any good. Turns out it was good. It was more than good. Stephanie Levy is an artist and illustrator and when I popped in to look at her shop I realised I'd admired her work on Etsy before. She's an American ex-pat who lives in Munich with her German husband and two young daughters. Having lived in Germany for almost 16 years she has a unique international perspective which I liked. What an amazing thing to be able to take a course run by an artist from Memphis based in Munich, while living in Melbourne, Australia along with classmates from all over the world. Yay for the internet! Now tell me, in which real-world classroom could you get that experience? At first I wondered what direction the course would take. I was afraid of too much introspection and not enough action. While I enjoy navel-gazing as much as the next artist/writer, I do like to get things done and luckily Stephanie's course provided just the right balance of contemplation and practical advice for making your goals happen. While we were given activities which encouraged us to believe in ourselves, protect our creative dreams and break through self-imposed barriers, we were also given very useful, specific information about setting up an on-line shop, a website, a blog and how to build connections. I liked that it was a holistic course too and Stephanie emphasised the importance of looking after yourself - moving your body and eating well (she provided some yummy recipes, which were all vegetarian - yay!). She even had some ideas for pampering and self-care. 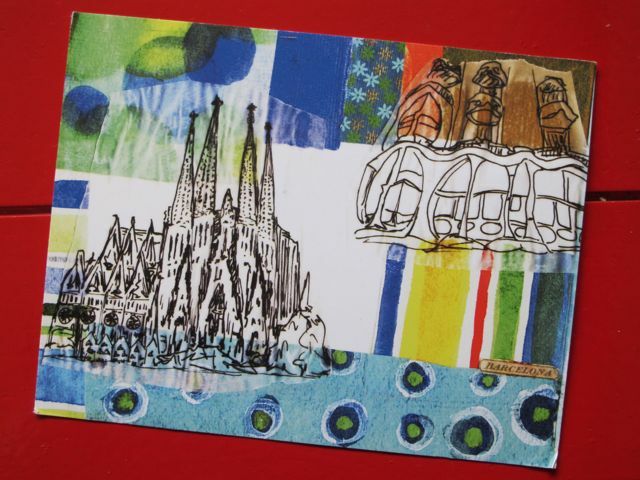 As part of of her 12 Countries in 12 Months project Stephanie took us on a 'virtual field trip' to Barcelona for a week where she posted touristy photos, foodie shots and sneak peaks of interviews she did with artists. 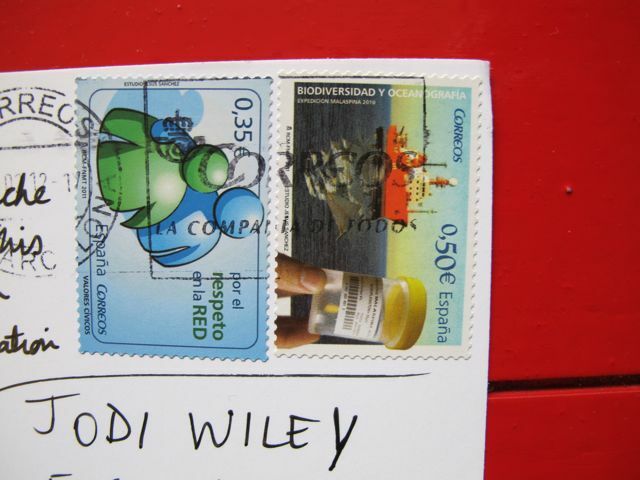 And to make the experience even more personal, she sent each student an actual, snail-mail postcard from the capital of Catalonia! Here's mine. So cool! The barrier of distance and time-zone was overcome though Stephanie's Monday videos where she talked to the camera in her warm and articulate way. Stephanie was very open and generous with her knowledge and her own story. We got to find out how she got to where she is - both as an artist, and how she ended up living in Germany. She was able to build a sense of safety and trust in her 'classroom' which any good educator knows is vital. So not only is she a talented artist but, as it turns out, a natural teacher. I also had a great sense of being involved in the 'virtual' community. There was a private Facebook group in which many students interacted, shared ideas, asked questions and gave each other encouragement. There was also a Flickr group to share images (I have to admit, I wasn't so active in this because I don't use Flickr ordinarily). There was also opportunity to get involved in daily discussions through the comments section of each 'lesson'. So no matter what your 'thing' is - whether it's Facebook or Flickr (or neither), you can still be fully engaged. Some students who lived in the same city even decided to catch-up for some real 'facetime' and posted to the Facebook page a photo of them out to lunch. Amazing! And, of course, like all endeavours, you get out of it what you put in. I tried really hard to do all of the set tasks, which were not arduous at all - they were fun, varied, creative and often thought-provoking. This 'wish jar' was one of the activities. 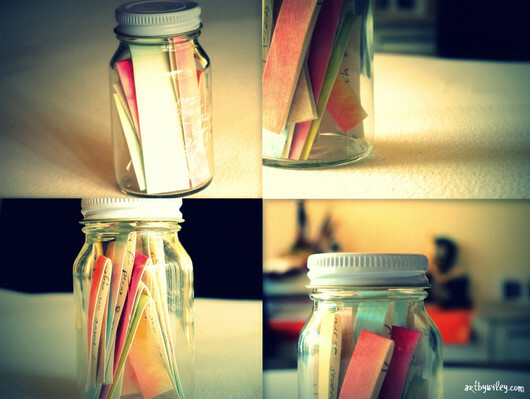 It contains all of my wishes for a creative future. I now keep it on my desk and can look at my wishes (or goals, really) to remind myself what I'm working towards. 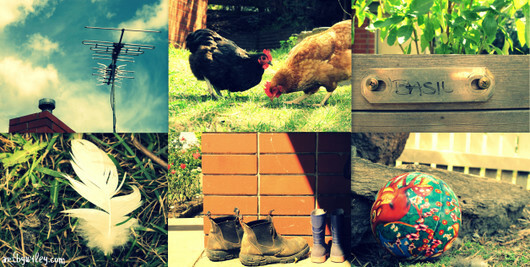 And in another task, we were encouraged to look at our local environment through a tourist's eyes and because I found it hard to get out that week with my two little ones, I made a photo-collage of my yard! I also made a real effort to be active on the Facebook group and tried to respond to the prompt questions in the lessons as much as possible. As a result, I found the sense of community and support really wonderful and was able to get feedback and advice on some of the things I was working on. I didn't really have any crazy epiphanies during this course. Nor did I change my career goals or artistic direction. But I did feel that I consolidated my plans, and felt a little more validated, as Stephanie encouraged us to take ourselves and our creative goals more seriously. * I applied for and was offered the role of monthly book review columnist at Creative Women's Circle. * I began my interview series on this blog. I'd been planning it for ages but through the support of those in the course, I felt much more motivated to see it through (it's more work than it appears!) and also found inspiration in Stephanie's Artists who Blog series which was new to me and a fabulous discovery! * I set up my own website after trialing several options put forward by Stephanie. It's still a work in progress but I'd been dreaming about it for years, thinking it was too hard, too big. But here it is! These are the main, big things. And while it's true that I could have accomplished them without the course, I think the momentum of being involved with it pushed me to achieve. This was certainly true of the website, which might have stayed on the backburner for many more months had Stephanie not provided such good and accessible information. The other, more intangible, thing was that I got encouragement and support from Stephanie and the other students, and was exposed to new perspectives, ideas and opportunities. The range of students and their creative fields was fascinating. There were artists who painted, used mixed media, illustrators, ceramicists, photographers, fiber artists, quilters and many more. It was fantastic to get an insight into other people's processes and working methods. But it was also illuminating to know that we're all also dealing with similar concerns, questions and goals. Oh, and the weekly artist interviews were fantastic! Really, really amazing and insightful and contained so many ideas and links to follow up I seriously thought my head would explode. In a good way. So if you're looking for something to get you moving on your creative work and goals, if want to make connections with people from all over the world who are interested in the creative life or if you're just looking for something fun and invigorating, I would recommend this course. I see there's another one starting April 9 and Stephanie's going to Paris for a week during this one. Ooooh, I'm sure there'll be some vicarious pain au chocolat experience happening there! As well as a lovely postcard from the French capital. She's interviewing a stack of new creatives too and if I wasn't already doing another e-course starting soon (haha! I could become an e-course addict), I might've jumped on board again! Creative Courage e-course - check it out!